Composed by Al Cofrin based on the vocal piece Los Sept Goyts from the Llibre Vermell de Montserrat, ca. 1300. Anonymous 13th c. Trouvere piece. Richard Coeur de Lion / Blondel de Nesle, late 12th c.
Supposedly written by Richard I of England while he was in prison in Germany 1192-1194, decrying his sad state. Blondel is attributed legendarily with finding the imprisoned King and spreading the word of his state. Alfonso X (Spanish 13th c.). One of the over 400 Cantigas de Santa Maria, a huge collection of songs, both secular and sacred, assembled by King Alfonso X in the mid 13th century. Lyrics from Betran D'Alamanon or Gaucelm Faidit (13th c. French), music adapted from a 13th c. anonymous motet. The original title is Us cavaliers si jazia. English translation based on Willard R. Trask from his text Medieval Lyrics of Europe. You can't have a harp album without the Irish master. Supposedly this was the first piece he composed after he had gone blind and was trying to become a bard. Guillaume de Machaut (14th c. French). An almost near eastern arrangement of this normally sedate and lovely piece. Machaut is perhaps the most famous of the 14th. Century composers. Based on several tunes and their arrangments heard on Beth Kolle's harp album The Northern Folk Harp, which I highly recommend. Either Michael Praetorius (1612) or Pierre Francisque Caroubel (ca. 1600). And I always thought this was a Spanish piece. Traditional Scottish / Child Ballad #239. Based on Loreena McKennitt's variant from her album Elemental. Possibly the first full song I learned on harp. Guglielmo Ebreo (15th c. Italian). This slightly odd version of the dance comes from a unique french manuscript that writes out the improvisations done above the tenor. The regular dance may be done to it. Written as a tribute to Donald Snow, else known as Gaston D'Amberville, after his passing. He had just taken up the harp beforehand. Tielman Susato (16th c. Flemish). Based on pioneer early harpist Elena Polonska's grouping. Susato was one of the most prolific Renaissance publishers of part secular music. One of my general favorites, normally done more elaborately than this, but I wanted to try one solo on the tenor vielle. 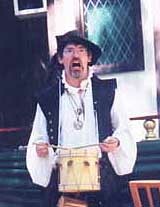 William Byrd was Queen Elizabeth I's court composer. This was one of his most popular pieces. Based on the variant performed by Maddy Prior and June Tabor. Celebrates the famous battle where Henry V of England routed the French army in 1415. All instruments and vocals performed by Paul Butler. except Track 11, recorded, mixed and mastered by Alfred Goodrich at Silvertone Studios in Ardmore, PA.
Additional mastering done by Alfred Goodrich at Silvertone. ℗ 2004 Paul Butler All rights reserved. Of herpers notys and gytherners, of sytall and of sautrey. by George Stevens in ash wood. Part of "buzzy" sound very popular in the medieval and renaissance period. The strings are anchored by "L" shaped pins that brush them lightly, creating a buzzing drone beyond the note of the string. 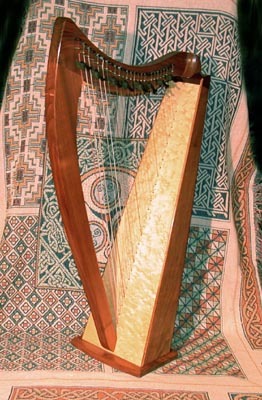 The frame and soundbox are very small and narrow (compare to the folk harp below), so normally they aren't as loud as the modern harps. 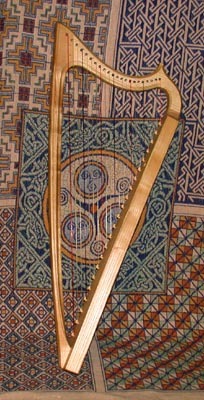 But the buzz creates a louder, more piercing tone, so this little harp can actually be heard over the larger folk one. Acquired from the Early Music Shop in England. This one was made in 1991. It has an unusually rich sound for a Dusty of its size, fuller than most of the FH26's I've tinkered with in the last couple of years. Could be a fluke (I'm known for finding the fluky good instument), could be that the laminates used now are not as clean as the ones used then, or that the slight design changes have made that much difference. Whatever the case, this one shows no signs of aging (or soundboard warping), and I'm happy with it! Discovered at the Bucks County Folk Music Store. the little dark one in the center. the lighter colored one on the left. the long dark one on the right. 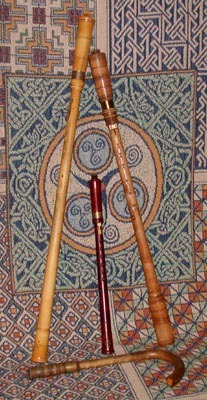 The soprano and tenor were acquired as used instruments from the Early Music Shop in England. The Koch is at least 40 years old, as he passed in the 1960's. The Kobliczek is only a couple of years old. The Kynsecker I won on eBay, a useful source for finding early instruments if you know what you're looking for. This is small dark one in the center. The medium toned one on the right. • RWC tenor cornamuse (kit-built). The light one on the left. 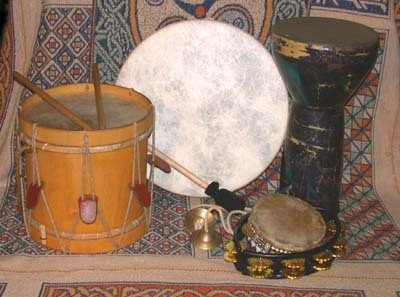 The soprano and tenor were acquired as kits from the Early Music Shop in England. The alto was acquired used from EMS, and is also fairly old - I'd guess from the 1970's. On the bottom of this picture is my soprano crumhorn, also a kit from EMS. It wasn't used for this recording, but is usually grouped with these instruments, so I stuck it in. by Marco Salerno, in style of 15th century. Presently tuned more or less like a modern violin, and about as large, though not as loud. Acquired, like most of my instruments, from the Early Music Shop in England after playing every vielle they had in the shop, practically. 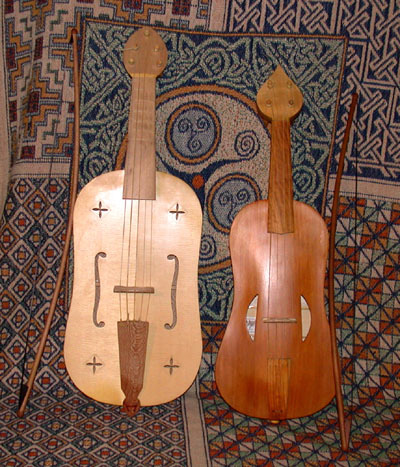 • 5-string Memling vielle by Bernard Ellis. Ellis passed several years ago, and I had lamented not being able to acquire one of his fine instruments, when lo and behold, a used one came up in EMS! So I was able to acquire this older one (from the 1980's). This is modeled after the painting by Hans Memling of an Angel playing this vielle, from about 1450. Vielles are one of the precursors to the modern violin. They have almost guitar-shaped deep bodies without soundposts, strung with natural gut (spun sheep's intestine - mmmm, tasty!) tuned in open chords, and are sometimes fretted. The Memling fiddle used here is fretted, the treble one is not. They are played at the shoulder, but with a shorter, arced bow that weighs functionally nothing and is strung with natural (black) horsehair. • tamborine pair - mostly the black EYE tamborine of unknown maker, or the smaller mid-east manufacture one with it. • zills - affectionately known as "the dingers" are the miniature cymbols front center. This picture from the Maryland Renaissance Faire.